Could Apple's next-gen iPods be able to receive and record a TV signal? If you think that's more suited to an iPod Touch, guess again—as these unearthed patents reveal a Classic is also being considered. 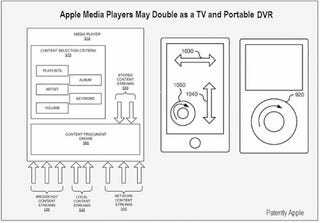 According to Patently Apple, the US Patent & Trademark Office published an application from Apple on the 14th of January 2010, showing potential for the iPod to "double as a TV and Portable DVR." Expanding on the iPod Nano's ability to pause and tag live radio, Apple's supposedly looking into doing the same for the iPod, only with live TV. DTV is still a relatively new concept to the western world, with LG introducing some of the first dedicated devices last month. It wouldn't be too difficult for Apple to shake up the industry once again, doing for TV what it did for music and movies. "a content stream may be a serialization or sequence of content. The content stream may be distributed in real time, such as a broadcast, or in non-real time, such as a network stream or podcast." If there's one thing I know by now, it's that this won't come cheap, and that iTunes will be required every step of the way.